Two independent travelers with an inspired itinerary were on a road trip from Munich to Alsace, France and selected the university town of Heidelberg as a stopping point to keep their drive time reasonable. We begin planning our road trips well in advance of the actual journey and strongly recommend using the free app from Michelin (viamichelin). Getting familiar with the tool beforehand gives you the confidence to use it during your road trip. Check it out to learn more. The drive was uneventful and a little longer than expected due to road construction but we try to leave a little slack in our plans… less stress, the slow travel way. Our hotel research was also done well in advance, since this was our first visit to a new region of Germany. The selection process came down to location and proximity to the “Old Town District”, The Neckar River and the famous “Old Bridge” and, of course, the Castle. Using “Trip Advisor” to scan the options we selected the “Hotel Hollaender Hof” and booked directly with the hotel. We requested a room with a nice river view and on a high floor… the booking was confirmed. When we are close to our departure date we do some pre-trip research and usually check the events calendar of the local tourist boards. We noticed that on the date of our visit, purely by chance, there was a special celebration known as “The Illumination of Heidelberg Castle” which has a spectacular fireworks display… located right on the Old Bridge… right out our hotel room windows! If you can, try to book room 340. The hotel is positioned on the river and we expected that the parking may become a challenge but to our surprise there was more than ample parking disbursed throughout the town. The ”Oskar Restaurant” was located on the side street next to the hotel and it became surprise number two. It was wonderful. The seating outside on a very warm night was peaceful and romantic. Their menu was upscale, extensive and definitely unique… we started, of course, with an excellent dry German Riesling wine, followed by warm bread with a tasty herb spread, and a tiny cup of cold tomato soup. Then onto the more serious treats of beef carpaccio, a grilled octopus salad, and for the main course we split a beautifully prepared skin-on fried sea bream served on a bed of leek risotto with lemon sauce. Dessert was a biscotti and sherry for a nightcap! As a side note, many people are reluctant to order German white wine after having it stateside because it is usually sweet. We found the German wines to be consistently excellent and to avoid the sweet offerings simply ask for a “Trocken” (dry) wine in a modest price range and you will be surprised. The main tourist attraction in Heidelberg is their famous Castle and that was the target on our second day in town. We headed out to the tram and enjoyed a brief but very scenic ride up the mountain to the first stop, the Castle. It is possible to continue the tram ride to the top of the mountain if you were so inclined (no pun intended). 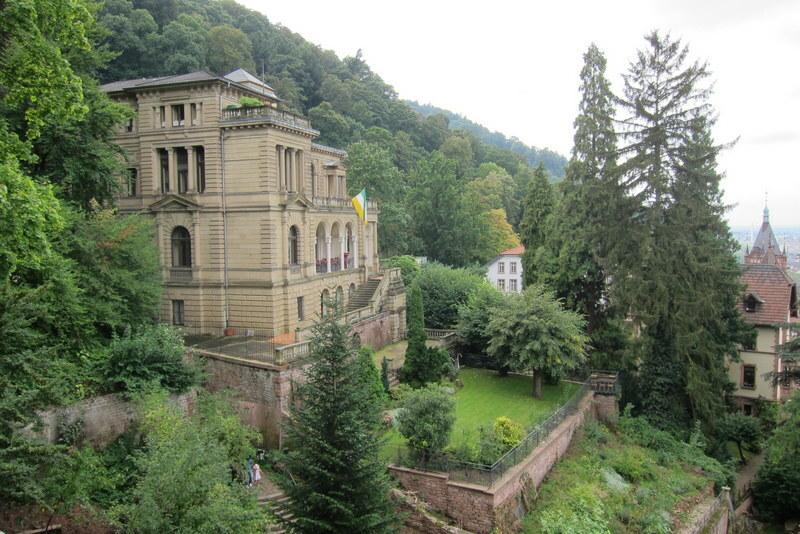 The Heidelberg Castle is actually the famous ruin of the original structures dating back to 1214. Over the centuries it was expanded, destroyed by lightning, rebuilt, and damaged by wars and more fires and rebuilt again. The present structures were once again destroyed by a lightning bolt in 1764 but fortunately they are regarded as a German landmark and are now being preserved. A visit to the Castle really deserves a dedicated four hour visit (a morning or an afternoon) and is greatly enhanced by a guided tour which is the only way you can see the interior of the castle. Second alternative is renting self-touring headsets and paying a nominal fee for admission to the Castle Courtyard which enables you to check out the enormous oak wine barrel (holding 58,100 gallons of wine), and also tour the Pharmacy Museum… all at your own pace and schedule… the slow travel independent approach. You can also simply walk along the outside of the castle and explore the grounds with their beautiful gardens and take in views of the city… all for free. The tram back to the village deposited us right in the middle of the “Old Town District’s” charming cobblestone streets and their amazing assortment of shops. 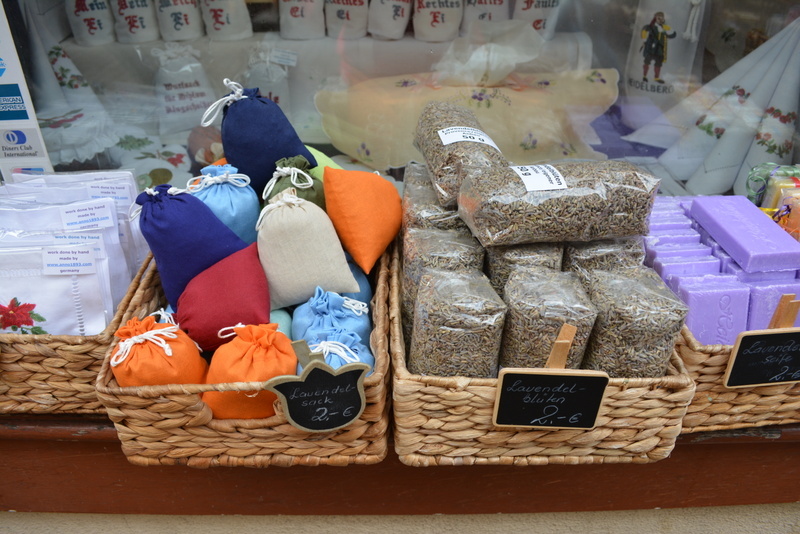 The options were vast and the surprise was just how many excellent shops as well as how many blocks were in the “Old Town”. We only spent a few hours here and that was just not enough. 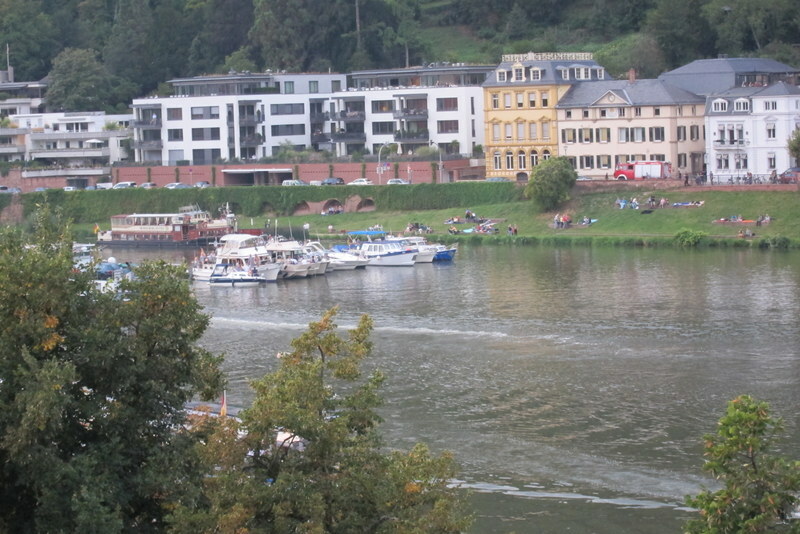 The ships in the Neckar River began amassing at midday and the crowds started to build all afternoon until becoming massive at sunset… tens of thousands of people on both sides of the river in a festive and happy mood… after all it IS a celebration! With the aid of a German “Open Table” app, we booked our dinner at the “Wirtshaus Zum Nepomuk” which had outdoor seating and was right next to the hotel. Our plan was to eat relatively early and get back to our room-with-a-view in time for the extravaganza. The light-the-fuse time was getting close so we skipped desert and made our way back through the crowd to our hotel room. We opened all the large windows, opened another bottle of wine, set up chairs overlooking the crowds and the “Old Bridge”. The history behind this spectacular is credited to the “Elector Palatine” Friedrich V, when he first brought his newlywed bride, Elizabeth Stuart, back to Heidelberg in 1613 and he greeted her with a fireworks show. The celebration has continued ever since and in 2013 (the year we were there) the event celebrated its 400th anniversary. The spectacle begins with the castle gradually being encased by a red light and eventually the lighting effects completely cover the structure… representing fire. The special effects would have made Walt Disney proud! After a few minutes the “flames” fade and the firework show over the bridge begins. The following YouTube URL is a brief video of the finale of the pyrotechnic extravaganza. We shot it from our room at the Hotel Hollaender Hof, and caught the action at eye level… enjoy! As slow travel proponents we really missed this one. The village and surrounding areas offer so much. Our slip-up was to use this as a way station instead of a destination… we hope you may learn from our mistake. After all, what is the hurry… be inspired! This entry was posted in Uncategorized on June 15, 2015 by Bob and Janice Kollar. Nicely done. We want to go!